Two senators, Abdullahi Danbaba and Isa Hama Misau from Sokoto and Bauchi States have condemned the statements credited online to their colleague, Adamu Abdullahi (Nasarawa) in which the latter claimed the Senate President, Dr. Abubakar Bukola Saraki, "merely collated the list of Senators he feels are not happy with the party (APC) and announced them as Defectors", and said he was only spewing forth lies unbecoming of an elder. The two Senators in a statement signed by them stated that Abdullahi thought all Nigerians were dumb by saying names of Senators were just announced when in actual fact the concerned Senators are individual political leaders in their different constituencies and were present on the floor when their names were read out from a letter signed by all of them. "People like Senator Adamu have become agents of instability and division in the Senate. This same Senator who was genuflecting before Saraki to get a Senate committee chairmanship at the beginning of the Eighth Senate suddenly made a turn-around to become a lap-dog of the Presidency because he is afraid of his past. It is public knowledge that the axe of the Economic and Financial Crimes Commission (EFCC) is dangling on him and one of his sons. "How possible is it for somebody to just announce the change of party on behalf of a Senator without the legislator concerned giving his consent. We can assure him that more Senators are preparing to leave the sinking ship of APC and Senator Adamu Abdullahi will have more fabrications to do. 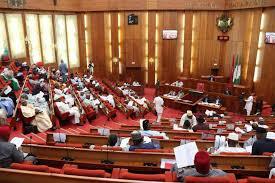 "It is surprising that a man of Adamu's caliber will say that the only defecting Senators are from Kwara. We wonder if Senators Danbaba (Sokoto), Isa Misau and Suleiman Nazif (Bauchi), Monsurat Sunmonu (Oyo), Barnabas Gemade (Benue), Ubali Shittu (Jigawa), Suleiman Hunkuyi (Kaduna), Usman Nafada (Gombe), Rabiu Kwakwanso (Kano), Abdulazeez Nyako (Adamawa), and Dino Melaye (Kogi) are also from Kwara State. "Senator Adamu is struggling to save his skin but he should at least care about the credibility of the information he is giving out. At his level, he should refrain from circulating fake news", Senators Danbaba and Misau stated.